Stopping for breakfast, Victor asked if he could sit with me. What a nice man he turned out to be. We chatted away in spanish nearly all the rest of the way to Antigua, he very patiently spoke at a snails pace and nicely corrected my grammar. We shared some laughs and our stories and he proudly showed me his country. Along the way he pointed out fields of peanuts, cashews, melons (4 types), bananas, etc. The six hour trip flew by and soon we were in Antigua. I got a big goodbye hug and kiss from Victor and he gave me a beautiful piece of obsidian he had in the van with him. He has two, twenty something sons, one married but no grandchildren and his brother who lives in California trys to get him to move there, but Victor likes the country life in Guatemala. He drives the Copan/Antigua route every day and although his home is in Guatemala, close to Antigua, he overnights in Copan. He seemed to love his job and got plenty of toots and whistles from friends and acquaintances as we passed small towns and roadside stands along the way. Overnighting in Antigua was pleasant enough although the place has changed since my 1990’s visit and it has lost some of its charm and beauty and seems a little grittier and not as cultural as it once was. A new day and a new driver, we were the last to board the shuttle for the ten hour trip to San Cristobal Chiapas, Mexico and got the last and not the best two seats in the van. Imagine our relief when we were told that the majority of people would be leaving us at Lake Atitlan just an hour or so from Antigua. Travelling north through Guatemala headed to Mexico is one breathtakingly long string of mountains, valleys, gorges and high altitude fincas wih their geometric emerald green terraced fields climbing high above the roads. Many settlements along the road are separated by deep gorges but connected by suspension bridges just wide enough for small vehicles, carts, animals and people. The further north we went the poorer the country seemed and of course Guatemala City, which we had a stop in, is no longer the city I saw in the 90’s. Back then, before the challenges of the new millennium, the centre of the city was accessible. Now to arrive at the centre you have to cut through miles of barrios, slums and ramshackle commerce to penetrate to the core. Urbanization, a world wide problem, has greatly impacted the capital cities in Central America where millions leave their country homes for the big cities seeking to improve their fortunes. 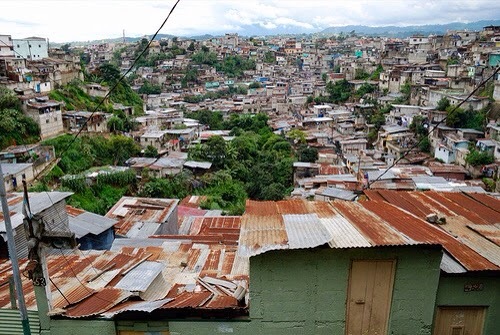 Sadly, only a few manage to penetrate the economic, social and racial barriers and end up instead, just surviving in the slums like the ones that climb up and down the gulleys, hanging precariously off the sides of the hills in Guatemala City. The countryside of Guatemala is spectacularly beautiful and we both agreed that given more time we could easily have spent a week or more wandering and seeing more of rural Guatemala. Anos proxima! Great blog Stella, I agree Guatemala has changed along with the rest of the world!